Nagoya Castle has never been one of the top castles that I had ever wanted to visit, even though it is one of the most famous castles in Japan. When I first came to Japan, my love of Japanese castles stopped at recreations that were concrete after visiting the inside of Hiroshima Castle. Unless they made wood recreations, I didn’t want to see interiors of the castle. 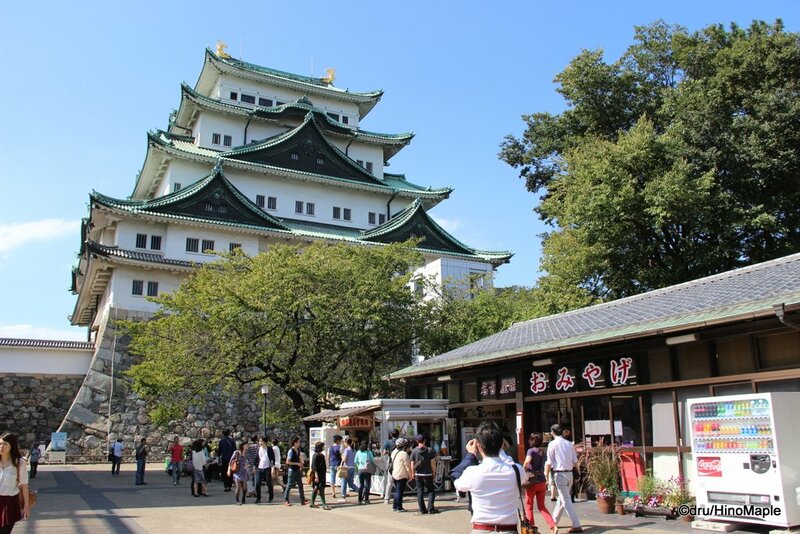 I was hesitant to visit Nagoya Castle because it is a concrete recreation of the original. The castle grounds are pretty big and for that alone a visit to Nagoya Castle is worth a visit. 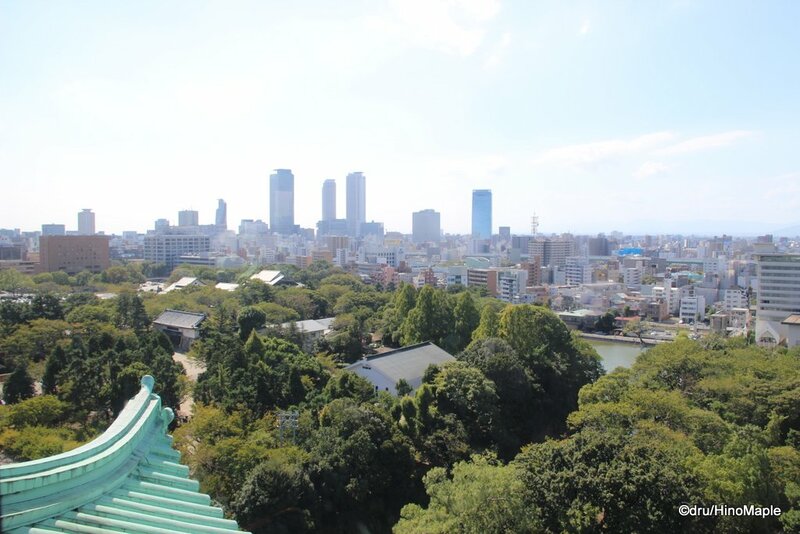 I wouldn’t recommend people to visit Nagoya Castle if they want to see a real authentic castle but if you want to see a recreated castle with a beautiful park, I would recommend Nagoya Castle. I would also recommend Nagoya Castle for their new Honmaru Palace. While the Honmaru Palace is only 1/3 complete, with the final phase being scheduled for completion in 2018, it does make the fee to enter the castle grounds worth it now. When I visited Nagoya Castle, I started at the east entrance. I started off at Meijo Park which is just north of the castle and then walked all the way to the east gate. The east gate is located next to the Ninomaru Gardens. 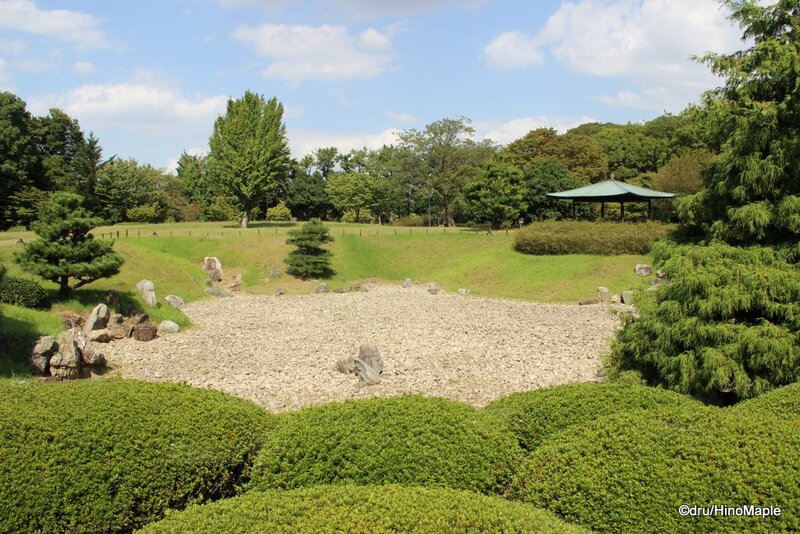 The Ninomaru Gardens are a nice place to relax and a lot of people don’t actually visit these gardens. I was surprised to see only a few people there compared to the main attraction, the castle itself. I guess people aren’t too interested in gardens these days but that means I almost had the entire garden to myself as I explored every facet of the garden. Walking along the castle walls and enjoying the views of the moat was a lot of fun. I found the main garden to be particularly interesting. The main garden appears to be a sub garden of the Ninomaru Gardens as it is enclosed by a lot of trees and the paths are pretty small and twisty. The area is also smaller than the eastern section of the gardens which, from the websites I found, appear to be the secondary garden even though it is bigger in area. I didn’t see many flowers but the plant life was abundant and the peacefulness of the main section compared to the other sections was more relaxing. Next to the Ninomaru Garden is an open courtyard area. This area was an interesting area because they had a small magic show, some food trucks, and a photo opportunity with two men dressed in old Japanese clothes. At the time, I didn’t really know what it was about, but later on it seemed as if they were the official tour guides of Nagoya Castle. 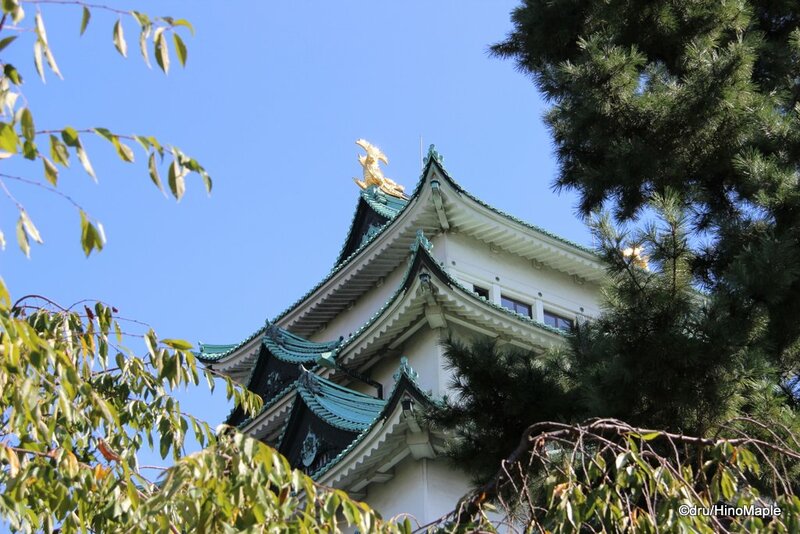 Nagoya Castle offers free tours to people, with English tours given once a day. The courtyard area isn’t too interesting unless you want a snack or to see what other entertainers are there on that particular day. 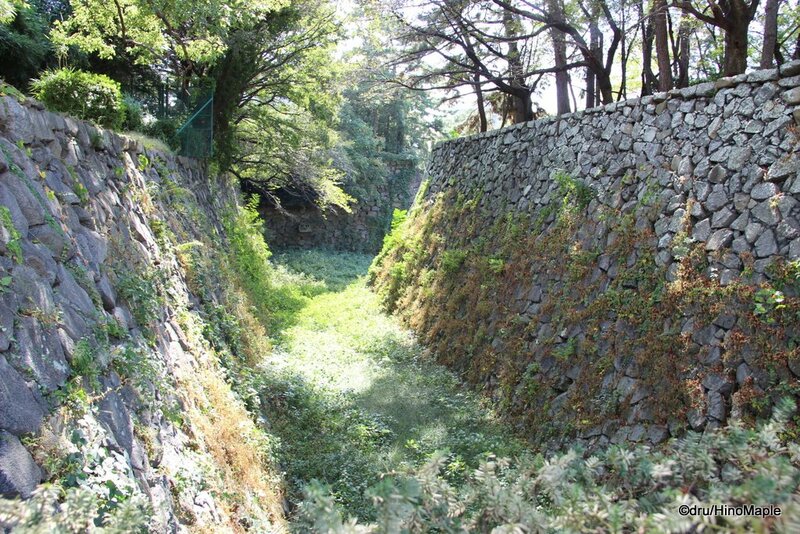 As you make your way to the main castle entrance, you pass several dry moats as well as other historical sites. There are several carvings on the rocks which show the seals of the various rulers at the time as well as some secret seals of the labourers themselves on the castle walls. Most of the seals are hidden on the underside or the hidden side of the rocks. Before you head into the main castle area, you can visit the Nishinomaru area which is just inside the main entrance gate. The Nishinomaru, not to be confused with the Ninomaru area, wasn’t particularly interesting as it was just a simple garden with a few halls and after visiting the Ninomaru Gardens, the gardens at Nishonomaru seemed pretty simple and uninteresting. Behind the Nishinomaru is the Fukaimaru. The Fukaimaru is another garden that I enjoyed because most people avoided it, or didn’t know it existed. I saw only a couple people while I was there and the garden itself was different compared to both the Ninomaru Garden and the Nishinomaru area. I felt it was a bit more westernized, but still very Japanese. The main structure in the area is the Nogi warehouse. It is the same Nogi that has his own shrine in Azabu, Tokyo who ended up killing himself after Emperor Meiji died. You can read a lot about General Nogi at Rurousha’s blog. While the Nogi warehouse is not very interesting, it played a very significant role in Nagoya Castle’s history. The design of Nagoya Castle is such that it can be split into 4 quadrants. There is the central quadrant holding the main castle; one to the southwest holding the Nishinomaru; one to the east southeast holding the Ninomaru; and then the northwest quadrant holding the Fukaimaru. When you visit Nagoya Castle, the Fukaimaru feels like a separate area which helped preserve the small area during WWII. When the main castle and palace were destroyed by bombing and fires during WWII, many of the silk screens from the main palace were placed in the Nogi warehouse and saved. I was happy to hear about that and it seemed to be a miracle that some of the original wood screens were saved. These original wood screens are still being used as references for the new screens that are in the new palace. You can even see the construction work being carried out on the new palace as the workers workspace is viewable to the public next to the Fukaimaru area. The workspace can be found between the Fukaimaru and Nishinomaru inside a large temporary modern warehouse where you can see the different workers work during the week and all of the beams and woodwork being worked on before being put up at the Honmaru Palace. The main attraction must be the castle itself. The main donjon, or castle keep, is unfortunately a concrete reconstruction of the original castle. The exterior looks nice, aside from the modern elevator on the side that looks akin to Osaka Castle’s elevator. Thankfully the elevator is in a discrete location where most people won’t be photographing it. The main entrance is through a side building and once you are inside the castle, you can enjoy the exhibits presented within. You can see life sized replicas of the Kinshachi, or golden dolphins. The Kinshachi are quite beautiful and they did surprise me. I was expecting something that was golden but the brilliant shine of the Kinshachi on that sunny day was amazing. Of course you can’t get up close to them but there was a full sized model of the Kinshachi on the main floor of the castle and that was good enough. As you make your way up the donjon, you get to see life in Nagoya when the castle was originally built as well as some of the period clothing and swords. On the 5th floor, things get a little weird as you can actually “ride” a plastic Kinshachi. No, I didn’t ride one. You can even pull a replica stone to get a feel for the weight as if you were one of 7 guys pulling the stone. Once you reach the top, you are presented with a beautiful view of Nagoya, but unfortunately it felt too modern with the glass windows and air conditioning. Personally, the most interesting design aspect of the castle was the main staircase. It was designed as a double helix so that as you head up, you don’t run into the people who are heading down. It is a very useful design function of staircases that aren’t used enough in high traffic areas. The main attraction for me was the Nagoya Castle Honmaru Palace. The Honmaru Palace is being completed in 3 phases. The first phase, the Entrance hall and Main hall, was completed this year and opened to the public. 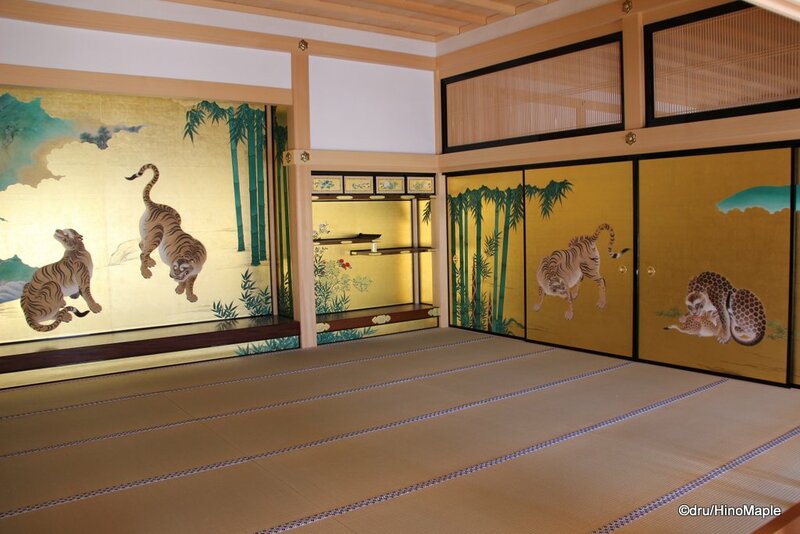 It showcases several tatami rooms with very beautiful wood screen paintings. They are covered in gold as well as other intricate images of various animals. I was amazed at the detailed work. The gilding of the various pieces was simply breathtaking and everywhere you looked, you could see an attention to detail that is hard to comprehend. After getting home and reading a bit more about the design, I was surprised at how the roof itself was constructed. The roof was made using very thin wood shingles called Kokera Shingles that are 3mm thick and secured with bamboo nails; talk about being as natural as possible. I’m not sure if the entire building was done in this sense but there was very little in the way of plastic and metal, as far as I could tell. Do be aware that if you have a bag, you are supposed to put it in a locker or wear it in front of you. I didn’t know about the lockers until after I finished walking around the entrance hall as the attendant at the entrance couldn’t explain it in English and didn’t attempt it in basic Japanese. 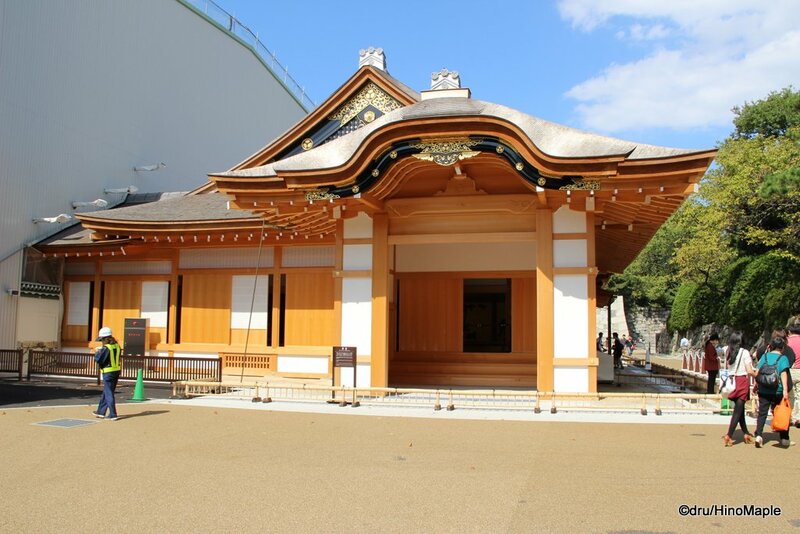 As for the rest of the Honmaru Palace, in 2016 the reception hall is scheduled to be completed and by 2018, the final phase, the Jorakuden hall and bathing room, is supposed to be completed and opened to the public. By then, I think I’ll make another trip to Nagoya to see this palace as from what I have seen so far, it looks amazing. Nagoya Castle was not a castle that I expected to be amazed by. I expected something simple and unimpressive. From this year, with the opening of the Honmaru Palace, it is a lot better. Once the Honmaru Palace is completed, I’m sure Nagoya Castle will be a very important place to visit, although the main castle keep will remain uninteresting to me. I’m afraid I still don’t care so much for recreations that are not made of wood, but at least they are getting things right with the palace. If you want to donate to the reconstruction efforts of the palace, you can put a few yen into the collection box at the top of Nagoya Castle but it is voluntary. I’m sure they’ll get enough money for it and it will look gorgeous when completed. I’ll be biding my time until the Honmaru Palace is complete and then I’ll probably have to fight the thousands of Japanese tourists who will be fighting to be among the first to see it completely. This entry was posted in Chubu and tagged Aichi, castle, Fukaimaru, Fukaimaru Garden, General Nogi, Golden Dolphin, Honmaru Palace, japan, Japan Castle, Japanese Castle, Kinshachi, Kokeara Shingles, Kokera, Meijo Park, Nagoya, Nagoya Castle, Ninomaru, Ninomaru Garden, Nishinomaru, Nishinomaru Garden, Nogi Warehouse by Dru. Bookmark the permalink. Hallo! Here’s Ru, catching up with your posts, and what a way to start: at a castle! I’ve never been a castle fan — to busy temple-hunting — but I may have to change my mind after reading this post. Yes, you may have to change your mind. I was definitely surprised by the castle grounds. I think spring might be even better with whatever flowers that are there would hopefully be blooming. 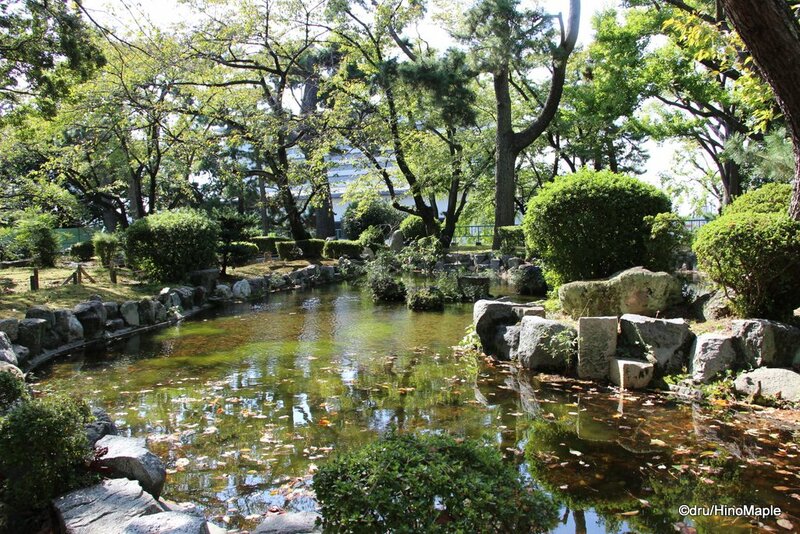 I’d love to sit and just empty my mind at Fukaimaru Garden.